Back in 1998, Pokémon was the shiz-nittle-bam-snip-snap-sack. Much like Ninja Turtles the decade before, Pokémon was -the- children's franchise. Even people who didn't watch the show could instantly recognize the American series mascot, Pikachu. It was during this time that Nintendo and Game Freak decided to release a giga-pet based on owning an actual Pokémon. And thus the Pokémon Pocket Pikachu was born. Now I know there are two version of this giga-pet, the original LCD one and the later GS color one, but unfortunately I only have the black and white one. There are a few differences between each Pikapal, but overall it's the same experience. Only a few animations, mini-game changes and the additional color make the difference. Pokémon Pikachu is slightly different from more traditional portable virtual pets in that Pikachu does not need to be fed, watered, or cleaned up after. Pikachu only requires interaction and exercise to keep him happy. The unit is a virtual pet, but it also has a pedometer function built in. With every step the user takes, the Pokémon Pikachu will provide credits ("watts") which can be used as presents for Pikachu. It's not an exact science, but around eighteen steps on the pedometer will earn one watt. Overall, your relationship status with Pikachu will be gauged on the Select screen a score. When you play with him, you'll gain points, and the more you have, the more he'll like you. You can gain more points by walking, shaking him, and giving him watts. You must be careful though because shaking him at the wrong time will cause him to become upset with you. Some examples are when he's stacking building blocks or sleeping. I haven't tried it while he is in the shower, but I know that in the GS version he gets frightened and runs away. Here is a list of activities I've seen Pikachu do. When you first get Pikachu he will be a little grouchy and just be "okay" with you. He won't look at you and he will spend most of his time doing activities on his own. As you spend more time with Pikachu, your friendship score will grow and you'll start seeing him engage in more activities. Giving him watt presents is also a great way to quickly boost the friendship. Different denominations of watts will prompt different reactions from Pikachu. 000: Pikachu will make an angry face and your friendship score will go down. 100+: Pikachu will cheer and do a small march. 400+: Pikachu will write you a letter. 500+: Pikachu will do a backflip. 600+: Pikachu will stare at you with cute eyes and little hearts will appear around him. 999+: Pikachu will perform a little show where he will either swim, hang-glide, play the trumpet/piano, or balance on a ball. If you're really gutsy, or lucky, you can bet your watts in a slot machine game. A 5 watt bet can net you 500 if you manage to hit all 7's. It is a little hard to do, but I have managed it several times. You can also get different combinations with fish, cats and flowers. Triple cats are pretty good because they net you a solid 50 watts. It's pretty easy to take care of Pikachu as he doesn't require 24hr attention. But if you do neglect him, his mood can quickly change. I forgot to put him in my pocket yesterday and he dropped from "loves you" to "likes you". Man, what a moody guy! A quick 500 watt dosage quickly bought him over though. I don't think Pikachu can die, but if you're really negligent I've heard Pikachu can become angry and eventually refuse to recognize the player. He will actually leave the giga-pet! You'd have to neglect him for several weeks though. Out of all my childhood toys, I have the fondest memories with the Pocket Pikachu. He has a variety of expressions and he is always busy doing something throughout the day. 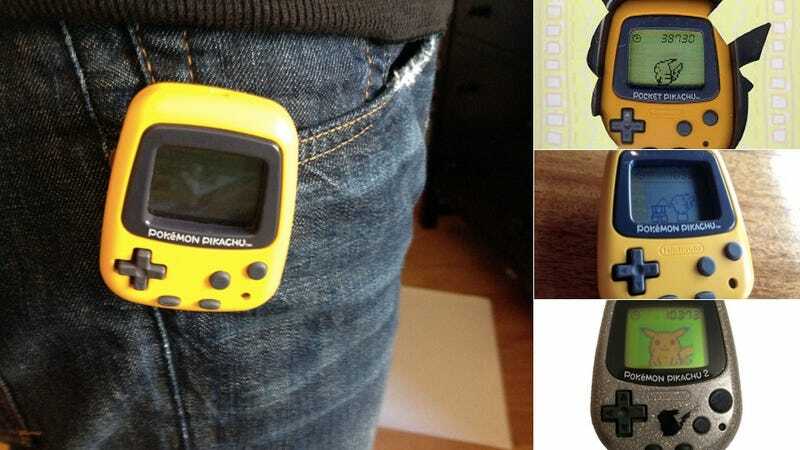 This is the closest you can get to actually owning a real Pokémon. (Lord knows we all had that dream when we were young.) The Pikapal originally sold for about $15-$20 in the U.S. but the price has gone up; now you have to eBay one for around $50. I'd like to try out the color GS model, but the prices seem too high. For now I'm fine with my original Pikachu at my side. John Kazemaini is the creator and managing editor for Tikisaurus.com. A video game blog specializing in off-beat and retro gaming news. Republished with permission.